HCM CITY – The south central province of Ninh Thuận, the country’s largest grape producer, plans to expand cultivation of NH 01-152, its new grape variety, because of its excellent quality and other outstanding characters. The variety, created by the Nha Hố Research Institute for Cotton and Agriculture Development, has been grown on a pilot basis but is in great demand already. Grown for eating fresh, it is crunchy and semi-sweet with firm flesh, a slight fragrance and just one or two seeds. Phan Công Kiên, deputy head of the research institute, said the institute is working with local agencies to transfer intensive farming techniques to farmers for growing the variety, which would gradually replace certain degraded varieties in the province. In the third quarter of this year the institute and relevant authorities would seek approval from the Ministry of Agriculture and Rural Development to grow the grape commercially, and subsequently introduce it to more farmers, he said. It is now grown on nearly 6ha in major grape growing areas like Ninh Hải, Ninh Phước and Ninh Sơn districts, Phan Rang – Tháp Chàm City and the neighbouring province of Bình Thuận. Nguyễn Khắc Phòng, who grows the grape on his 2,000sq.m farm to Vietnamese good agricultural practice (VietGAP) standards in Ninh Hải District’s Vĩnh Hải Commune, said he recently harvested the first crop, and it yielded one tonne per 1,000sq.m, fetching him an income of nearly VNĐ200 million (US$8,800). The cost of growing NH 01-152 is VNĐ30 – 40 million ($1,300 -1,700) per 1,000 square metre, the same as other grape varieties, but the income is higher, he said. The variety is suitable for growing in the province’s hot and dry weather and soil conditions and is resistant to diseases. It yields two crops a year. Traders pay VNĐ100,000 – 200,000 per kilogramme of the grape. The province People’s Committee has instructed relevant agencies to co-operate with the research institute to grow the new variety. 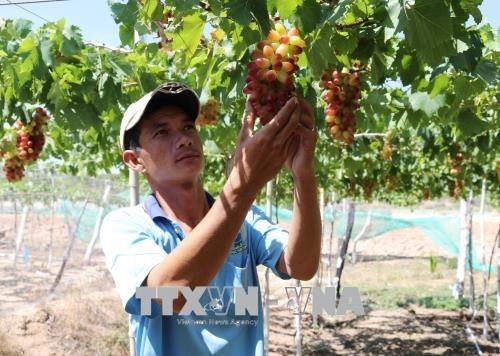 The province plans to create a large-scale field for planting the grape in Vĩnh Hải Commune this year, and this is also expected to be a tourist attraction.